The 1886 series recreates the elegant and efficient designs which established Hunter as the premier ceiling fan manufacturer in America over a century ago. Featuring cherry-finished basswood blades and a gorgeously detailed brass housing, this beautiful fan will cool your home in authentic Victorian style. 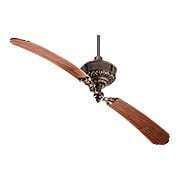 The Classic Original ceiling fan combines 19th century design and craftsmanship with contemporary technology. 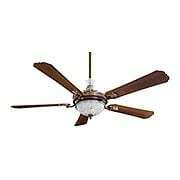 Nostalgic in appearance, yet so powerful and efficient, it earns the EPA's Energy Star Rating! Merging the beauty of a fine chandelier with the cooling function of a fan, the Cristafano is an elegant and useful addition to your home. It features gorgeous cut glass shades, intricate metalwork and five gleaming walnut blades. Merging the beauty of a fine chandelier with the cooling function of a fan, the Cristafano Deluxe is an elegant and useful addition to your home. It features a dazzling array of crystal prisms, cut glass shades, intricate metalwork and five gleaming walnut blades. 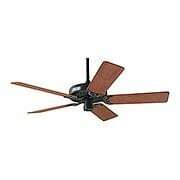 The Traditional Gyro combines twin fan functionality with elegant classical styling. 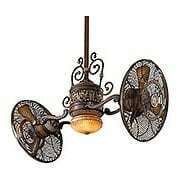 The graceful scrollwork, intricate cast details and lustrous walnut finish are worthy of the finest interiors, while the powerful motor and dual rotating fans offer state-of-the-art cooling. The complete assembly rotates 360 degrees at 3 RPM. 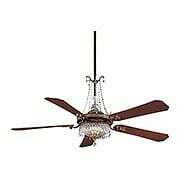 The intriguing Turner 68-Inch Ceiling Fan brings distinctive style to any room. It features two curved blades, intricate detailing, and a refined vintage design. Comes complete with full-function wall control.